It all started in a London bar. I was with my good friend John Mac, who is a professional photographer, and it was his idea to produce a trailer for my self-published children’s book, Sleeping with the Blackbirds, which I’d written awhile back. As it happens, I had already written a script to promote the book that had featured a letter written by the tale’s 11-year-old protagonist, Roy Nuttersley. So, a couple of days after meeting John, I emailed him my script. But, he wasn’t entirely convinced by all my visual thoughts. “We just need something more visually dynamic,” he said on meeting again. In the letter, narrated by Roy, we learn that his tormentor, Harry Hodges, is the son of a criminal who is in prison and it was this section of the script that excited John. “We have to find a prison to film in, mate. Then, we can move away from beautifully lit domestic still-lifes, and into atmospheric interiors with eerie sound effects.” I could see exactly where he was coming from. In no time at all, John produced an exquisite storyboard that he had photographed himself, and arranged a meeting with his contacts at Hogarth Worldwide – London’s premier post-production house. And, from this moment on, the project began to take on a life of its own. First off, we had to find the right voice for Roy Nuttersley. So, at John’s suggestion, I ran an online ad, and set up an audition. Ten parents answered the ad on behalf of their 11-year-old sons and, on the day of the audition, we had penciled two possible candidates by mid-day. But, after lunch, this changed with the arrival of Jacob Tofts. His mother deliberately sat at another table so as not to distract her son and Jacob then proceeded to read the script with such natural expression that John and I knew immediately that our quest was over. The following week, we arranged to record Jacob at Hogarth. Finding a prison wasn’t so easy. Decommissioned prisons are few and far between, look too modern for a suburban fantasy, and are prohibitively expensive to hire. So, it was with enormous relief that I stumbled upon Oxford Castle Unlocked, the 1,000-year old site that comprises various historic edifices, including a crypt and, yes, a prison. It was built in the 1800s, and remained in use as a high security prison until 1996. The whole site is now run as a museum. I was on the phone straight away, and discovered that we could film for an hour before the place opened to the general public. As expected, the prison, with its corridors, creaky gates and Dickensian cells, was absolutely perfect for our purposes. Two weeks later, we were back with camera, lenses, lighting equipment, and a fully kitted out prison guard in the form of one Philip Francis, John’s photographic assistant. With the central section of the film in the can, we now had to find props and a studio for all the other scenes. My first port of call would be The Stockyard in NW London, an extraordinary Aladin’s Cave of a place. Whatever you need for your film production, whether it’s huge Grecian columns or petrol pumps, you’ll find it all here. With the constant stream of articulated commercial vehicles coming and going, and carrying off enormous quantities of props for some far-flung multi-million pound productions, I felt something of a fraud. All I needed was a couple of antique book shelves, some old books, and a few fake rubber flagstones. But, find them I did. All we needed now was a cheap studio. Photofusion in Brixton was perfect. It’s a good space, and doesn’t charge ridiculous prices. It took John three full days to shoot most of our set-ups here. For the final scene in my garden, John was keen to create a rain machine to add atmosphere but, as luck would have it, the heavens opened for real. So, while my son helped operate the Heath Robinson rain machine, I had the unenviable task of dropping stacks of newspapers onto fake paving stones while being rained on by the rain machine, as well as the real thing. I think we did about 30 takes and my son had a lot of fun soaking his old man in the process. With everything filmed, it was back to Hogarth for editing, music, sound effects, animation, and grading. A couple of days later, we were invited back to look at the final cut. Seeing this on the big screen for the first time made the hairs on the back of my neck stand on end. We’d done it! You can view the book trailer HERE. 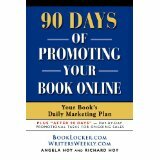 Readers of ReadersWeekly.com can pick up a free copy of the book HERE. And the book’s website can be viewed here HERE. Alex Pearl is an extremely short-sighted and slightly shambolic advertising copywriter living in London with more years in the industry than he’d happily own up to. Sleeping with the Blackbirds was his first self-published work of fiction and was first published in 2011. In 2014, his short story Scared to Death was published by MardiBooks in its anthology The Clock Struck War to mark the centenary of the First World War. Today he freelances through his own company (Alex Pearl Ltd) for an eclectic mix of agencies and clients, while also trying to write a thriller. His only other claim to fame is that he is probably the only human being on the planet to have been inadvertently locked in a record shop on Christmas Eve. One Response to "My Adventure Making a Video Trailer for My Book – by Alex Pearl"
and is it really worth the time money and effort ?? do you know anyone that hunts down book trailers to watch ? why would a reader looking for a book look for a video instead of text information? why would anyone be looking for that book in the first place. but would they click through on a random link just to see a book trailer, even if they knew what it was ?